White Paper: Intrusive vs. Non-Intrusive Electric Actuators: Which option is right for your installation? Modern electric actuators offer a wide range of technologies and features, from basic motor controls to sophisticated electronic controls. Many choices are available, since no single design or feature set meets the needs of every application. Actuators are motorized gear drives that control the operation of multi-turn valves, slide gates and dampers; or quarter-turn valves and dampers. Some actuators, including those compared in this paper, use electricity as a power source. Other types of actuators, such as those powered by hydraulic fluid or pneumatic pressure, are not addressed in this paper. Applications vary, requiring the user to select some form of actuator control system. Typical control systems range from simple electro-mechanical controls found in intrusive actuator designs, to solid-state electronic controls found in non-intrusive designs. Intrusive vs. Non-Intrusive Electric Actuators: Which option is right for your installation? 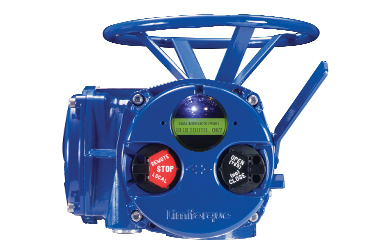 from Mead O'Brien, Inc.
Gas Powered Actuators - The Limitorque LDG direct gas actuator is designed to operate on high pressure pneumatic supply, including pipeline gases, nitrogen and any other equivalent high pressure source. 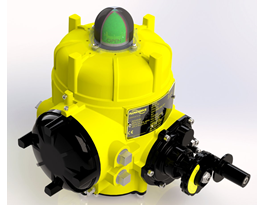 Hydraulic Actuators - LHS and LHH are Limitorque’s range of hydraulic, quarter-turn, scotch yoke actuators. Designed to meet or exceed the most current and stringent safety and reliability standards for application in the oil and gas industry LHS and LHH are suitable for on/off and modulating control of all quarter-turn valves. Pneumatic Actuators - Limitorque’s LPS and LPC are pneumatic quarter turn scotch yoke actuators, featuring a robust design suitable for heavy duty services, and among the longest design lifespans and maintenance intervals in the industry. Download the Limitorque Fluid Power Systems PDF here. With expertise in pneumatic rack and pinion and scotch-yoke, as well as electric quarter-turn and linear, Mead O'Brien has the experience and facilities to deliver a well engineered automated valve package. 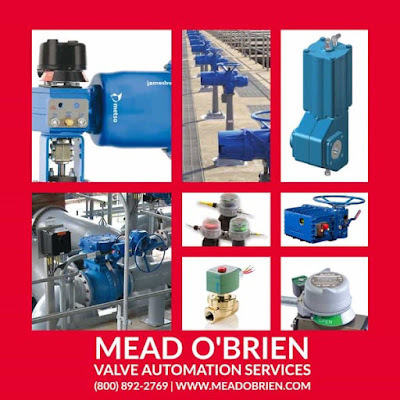 Call (800) 892-2769 or visit https://meadobrien.com for more information on any valve automation requirement. Valve actuators are selected based upon a number of factors including torque necessary to operate the valve and the need for automatic actuation. Types of actuators include manual handwheel, manual lever, electrical motor, pneumatic, and solenoid. All actuators except manual handwheel and lever are adaptable to automatic actuation. 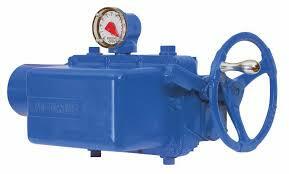 Manual actuators are capable of placing the valve in any position but do not permit automatic operation. 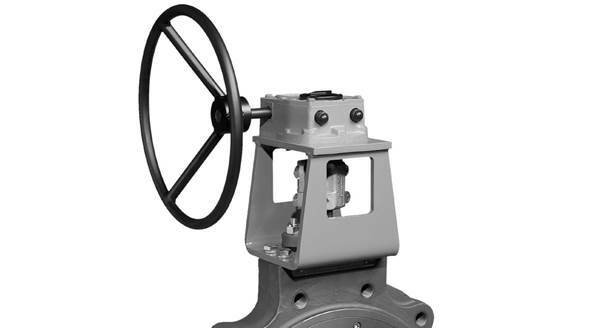 The most common type mechanical actuator is the handwheel. This type includes handwheels fixed to the stem and handwheels connected to the stem through gears. 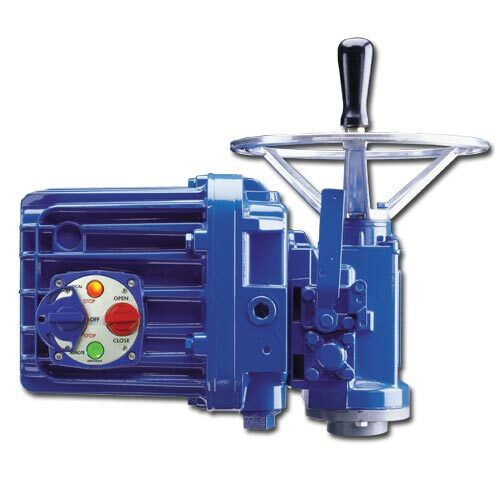 Electric motors permit manual, semi-automatic, and automatic operation of the valve. Motors are used mostly for open-close functions, although they are adaptable to positioning the valve to any point opening. The motor is usually a, reversible, high speed type connected through a gear train to reduce the motor speed and thereby increase the torque at the stem. Direction of motor rotation determines direction of disk motion. The electrical actuation can be semi-automatic, as when the motor is started by a control system. A handwheel, which can be engaged to the gear train, provides for manual operating of the valve. Limit switches are normally provided to stop the motor automatically at full open and full closed valve positions. Limit switches are operated either physically by position of the valve or torsionally by torque of the motor. Pneumatic actuators provide for automatic or semi-automatic valve operation. These actuators translate an air signal into valve stem motion by air pressure acting on a vane, diaphragm, or piston connected to the stem. Pneumatic actuators are used in throttle valves for open-close positioning where fast action is required. When air pressure closes the valve and spring action opens the valve, the actuator is termed direct-acting. When air pressure opens the valve and spring action closes the valve, the actuator is termed reverse-acting. Double acting actuators have air supplied to both sides of the vane, diaphragm, or piston. The differential pressure across the diaphragm positions the valve stem. Automatic operation is provided when the air signals are automatically controlled by circuitry. Semi-automatic operation is provided by manual switches in the circuitry to the air control valves. 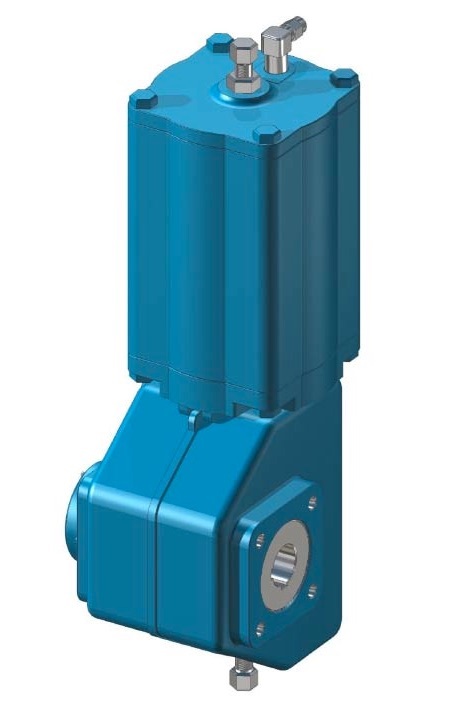 Hydraulic actuators provide for semi-automatic or automatic positioning of the valve, similar to the pneumatic actuators. These actuators use a piston to convert a signal pressure into valve stem motion. Hydraulic fluid is fed to either side of the piston while the other side is drained or bled. Water or oil is used as the hydraulic fluid. Solenoid valves are typically used for automatic control of the hydraulic fluid to direct either opening or closing of the valve. Manual valves can also be used for controlling the hydraulic fluid; thus providing semi-automatic operation. 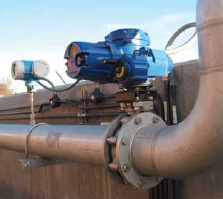 Solenoid actuated valves provide for automatic open-close valve positioning. 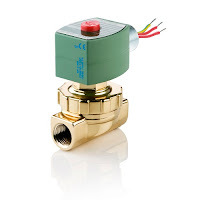 Most solenoid actuated valves also have a manual override that permits manual positioning of the valve for as long as the override is manually positioned. Solenoids position the valve by attracting a magnetic slug attached to the valve stem. In single solenoid valves, spring pressure acts against the motion of the slug when power is applied to the solenoid. These valves can be arranged such that power to the solenoid either opens or closes the valve. When power to the solenoid is removed, the spring returns the valve to the opposite position. Two solenoids can be used to provide for both opening and closing by applying power to the appropriate solenoid. Single solenoid valves are termed fail open or fail closed depending on the position of the valve with the solenoid de-energized. Fail open solenoid valves are opened by spring pressure and closed by energizing the solenoid. Fail closed solenoid valves are closed by spring pressure and opened by energizing the solenoid. Double solenoid valves typically fail "as is." That is, the valve position does not change when both solenoids are de-energized. 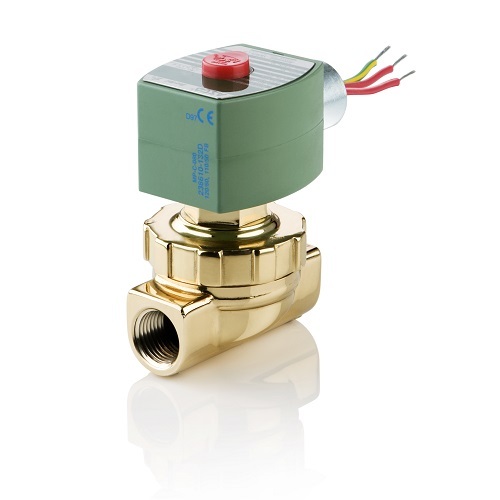 One application of solenoid valves is in air systems such as those used to supply air to pneumatic valve actuators. The solenoid valves are used to control the air supply to the pneumatic actuator and thus the position of the pneumatic actuated valve. 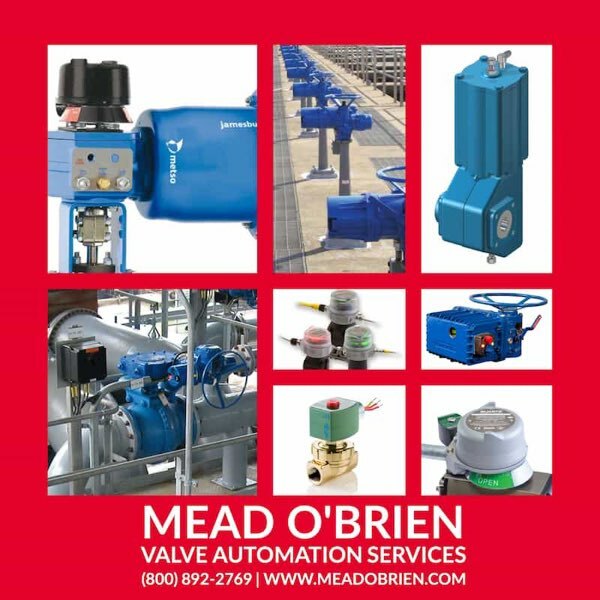 Mead O'Brien can handle any valve actuation requirement you have. Contact them by calling (800) 892-2769 or by visiting https://meadobrien.com. 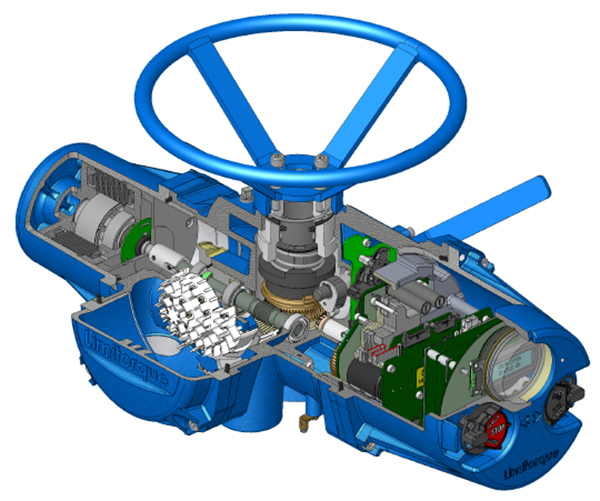 The most basic function of a valve is to be opened and closed, allowing or preventing a process media to flow. 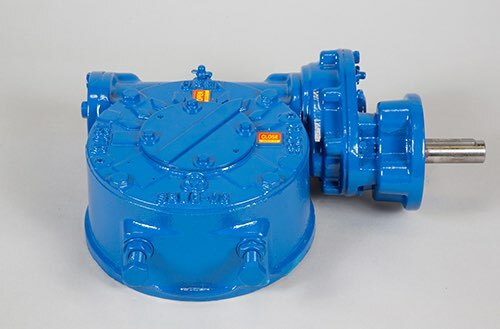 Gearboxes, such as the WG series, provide the mechanical advantage to make hand operation possible for most valves. The following installation and maintenance manual (IOM) explains how to install and maintain the Flowserve Limitorque WG operator. Information on installation, disassembly, reassembly, lubrication and spare parts is provided in the embedded document below. Alternatively, you can conveniently download the Limitorque WG Series Installation, Operation, and Maintenance in PDF here. Limitorque WG Series Installation, Operation, and Maintenance from Mead O'Brien, Inc.
Actuators are devices which supply the force and motion to open and close valves. They can be manually, pneumatically, hydraulically, or electrically operated. In common industrial usage, the term actuator generally refers to a device which employs a non-human power source and can respond to a controlling signal. Handles and wheels, technically manual actuators, are not usually referred to as actuators. They do not provide the automation component characteristic of powered units. The primary function of a valve actuator is to set and hold the valve position in response to a process control signal. Actuator operation is related to the valve on which it is installed, not the process regulated by the valve. Thus a general purpose actuator may be used across a broad range of applications. In a control loop, the controller has an input signal parameter, registered from the process, and compares it to a desired setpoint parameter. The controller adjusts its output to eliminate the difference between the process setpoint and process measured condition. The output signal then drives some control element, in this case the actuator, so that the error between setpoint and actual conditions is reduced. The output signal from the controller serves as the input signal to the actuator, resulting in a repositioning of the valve trim to increase or decrease the fluid flow through the valve. An actuator must provide sufficient force to open and close its companion valve. The size or power of the actuator must match the operating and torque requirements of the companion valve. 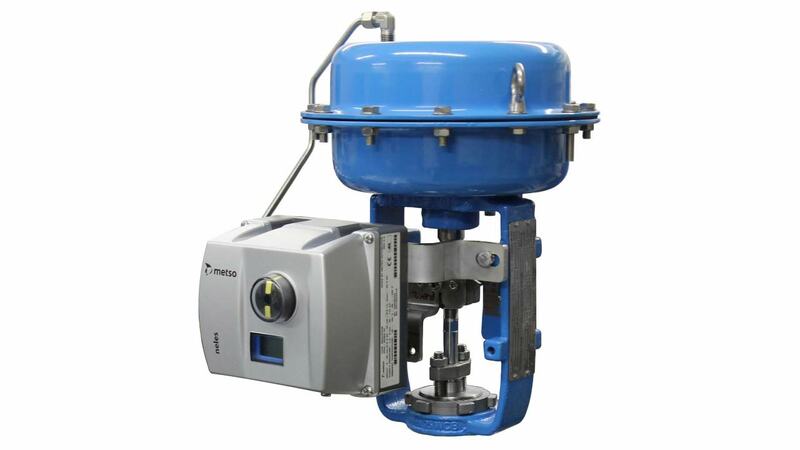 After an evaluation is done for the specific application, it may be found that other things must be accommodated by the actuator, such as dynamic fluid properties of the process or the seating and unseating properties of the valve. It is important that each specific application be evaluated to develop a carefully matched valve and actuator for the process. Hydraulic and electric actuators are readily available in multi-turn and quarter-turn configurations. Pneumatic actuators are generally one of two types applied to quarter-turn valves: scotch-yoke and rack and pinion. A third type of pneumatic actuator, the vane actuator, is also available. For converting input power into torque, electric actuators use motors and gear boxes while pneumatic actuators use air cylinders. Depending on torque and force required by the valve, the motor horsepower, gearing, and size of pneumatic cylinder may change. There are almost countless valve actuator variants available in the industrial marketplace. Many are tailored for very narrow application ranges, while others are more generally applied. Special designs can offer more complex operating characteristics. Ultimately, when applying actuators to any type of device, consultation with an application specialist is recommended to help establish and attain proper performance, safety and cost goals, as well as evaluation and matching of the proper actuator to the valve operation requirements. Share your fluid process control requirements with a specialist in valve automation, combining your own process knowledge and experience with their product application expertise to develop effective solutions. 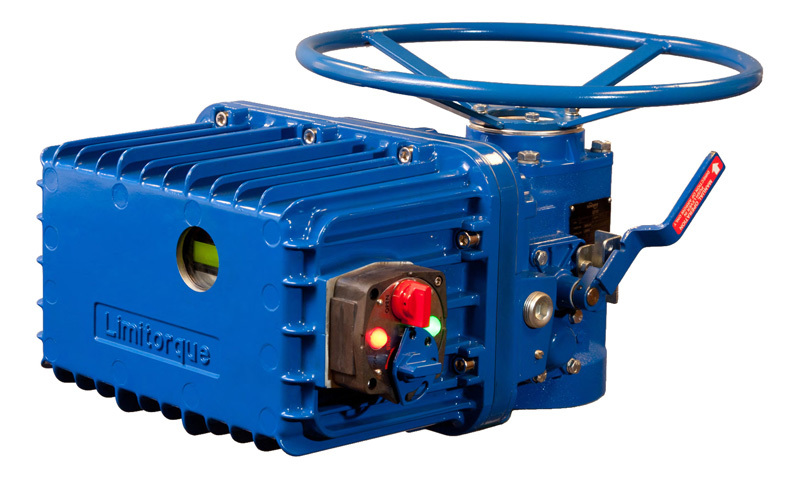 The Flowserve Limitorque QX quarter-turn smart electronic valve actuator continues the legacy of the industry’s state-of-the-art, non-intrusive, multi-turn MX actuator by including an absolute encoder for tracking position without the use of troublesome batteries. The QX design provides enhanced safety and reduced downtime through improved diagnostics, built-in self-test (BIST) features and LimiGard™ fault protection. The QX design builds on more than 10 years of experience with proven Limitorque MX technology - the first generation double-sealed electronic valve actuator from Flowserve designed to provide control, ease of use and accuracy. The QX includes all the user-preferred features of the MX in a quarter-turn smart actuator package. It is the only non-intrusive, double-sealed quarter-turn actuator to display the Limitorque brand. For more information on any Limitorque actuator, visit Mead O'Brien at http://www.meadobrien.com or call (800) 892-2769. Limitorque QX Electronic Actuator User Instructions from Mead O'Brien, Inc.
Limitorque factory trained technicians, support and parts. It's only factory authorized when the work is done by a Blue Ribbon Repair Center. Your Limitorque actuators were a major investment. Don't take chances with an unknown. 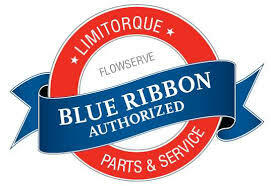 Choose only a Flowserve Limitorque Blue Ribbon Distributor to assure you're getting factory authorized service. It's just not worth the risk. The following are general guidelines for safely operating Limitorque actuators. This post is intended to supplement Flowserve / Limitorque's ongoing efforts to provide information on the safe and proper use of electric valve actuators on industrial globe, gate, ball, butterfly and plug valves. It is critically important to always refer to the installation & maintenance manual before applying, installing and servicing Limitorque actuators. If unsure about any of the recommended safety or installation procedures, contact a factory authorized technician before going any further. More than 1 million Limitorque actuators have been installed around the world, and some have been in operation for more than 50 years. The ruggedness and reliability of Limitorque electric actuators are among the primary reasons that customers continue to select Limitorque products. Actuators requiring 90° of rotation to operate are necessary for quarter-turn valves such as ball, butterfly, plug and dampers, and rotary control valves. These types of Limitorque electric actuators are available for operations such as open-close, modulating, network and rotary service. Multi-turn actuators are required to operate various types of rising stem valves such as gate, slide-gates, globe, check and linear control valves. These types of Limitorque electric actuators are available for operations such as open-close, modulating, network and linear service. Warning: Read the Installation and Maintenance Manual carefully and completely before attempting to install, operate, or troubleshoot the Limitorque actuator. Warning: Be aware of electrical hazards. Turn off incoming power before working on the actuator and before opening the switch compartment. Warning: Potential HIGH PRESSURE vessel — be aware of high-pressure hazards associated with the attached valve or other actuated device when installing or performing maintenance on the actuator. Do not remove the actuator mounting bolts from the valve or actuated device unless the valve or device stem is secured or there is no pressure in the line. Warning: For maintenance and/or disassembly of the actuator while installed on the valve, ensure that the actuator is not under thrust or torque load. If the valve must be left in service, the valve stem must be locked in such a way as to prevent any movement of the valve stem. Warning: Do not attempt to remove the spring cartridge cap, housing cover, or stem nut locknut from the actuator while the valve or actuated device is under load. Warning: Do not manually operate the actuator with devices other than the installed handwheel and declutch lever. Using force beyond the ratings of the actuator and/or using additive force devices such as cheater bars, wheel wrenches, pipe wrenches, or other devices on the actuator handwheel or declutch lever may cause serious personal injury and/or damage to the actuator and valve. Warning: Do not exceed any design limitations or make modifications to this equipment without first consulting Limitorque. Warning: Actuators equipped with electrical devices (motors, controls) requiring field wiring must be wired and checked for proper operation by a qualified tradesman. Warning: Use of the product must be suspended any time it fails to operate properly. Caution: Do not use oversized motor overload heaters. Instead, look for the cause of the overload. Caution: Do not operate the valve under motor operation without first setting or checking the limit switch setting and motor direction. Caution: Do not force the declutch lever into the motor operation position. The lever returns to this position automatically when the motor is energized. Caution: Do not depress the declutch lever during motor operation to stop valve travel. Caution: Do not use replacement parts that are not genuine Flowserve Limitorque parts, as serious personal injury and/or damage to the actuator and valve may result. Caution: Do not lift actuator/gearbox or actuator/valve combinations with only the eye bolts in the SMB actuator. These eye bolts are designed for lifting the SMB actuator only. Eye bolts in SMB and SB actuators are designed for lifting only the actuator and not associated gearboxes or valves. Mount the actuator with the motor in a horizontal plane, if possible. Keep the switch compartment clean and dry. Keep the valve stem clean and lubricated. Set up a periodic operating schedule for infrequently used valves. Verify all actuator wiring is in accordance with the applicable wiring diagram. Carefully check for correct motor rotation direction. If the valve closes when open button is pushed, the motor leads may have to be reversed. Verify the stem nut is secured tightly by the locknut and that the top thread of the locknut is crimped or staked in two places. Use a protective stem cover. Check valve stem travel and clearance before mounting covers on rising stem valves. Industrial process control encompasses a broad range of fluid handling operations. A significant part of fluid control is accomplished by valves, many of which are operated automatically through the use of actuators. Actuators are mounted on valves in place of, or in addition to, a handwheel, lever, or other manual means of opening and closing the valve. 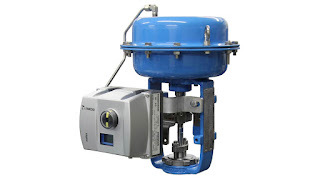 With an actuator installed, a control signal can be transmitted from a remote source to the actuator, commanding a change in valve position, and the actuator will respond by converting some form of connected energy into mechanical motion that positions the valve accordingly. Modern actuators are increasingly endowed with functions that provide information to the process operator, closing the loop with feedback that confirms the valve position, suitability of the energy supply to the actuator, and a range of other specialized data points. An eternal desire of all process operators is a reduction in whatever level of maintenance that is currently required to keep everything operating. Maintenance is costly and time consuming, a set of many specialized tasks, each with a probability of not being completed properly. Auto calibration and a user-friendly HMI provide optimized commissioning. Standard diagnostics include torque monitoring and actuator temperature, with early warning detection of undesirable conditions and an alarm output. Application specific brushless DC motors and worm gear drives reduce downtime. Tests have demonstrated reliability of up to 250,000 cycles. Modulating service can provide 1800 starts per hour with 0.1% position accuracy. Suitable for applications with rotary duty requirements of 90 and 180 degrees, as well as multi-turn duty to 20 turns. Available through a network of professional industrial process control distributors, with application assistance and product expertise. CEA is fully qualified to NEMA Type 4, 4X and6, IP66/68 Class 1, Div 1 and 2, Gps B,C,D (CSA,FM) and ATEX II 2G Ex d IIB +H2 T4: IECEx II 2G Ex d IIB +H2 T4. The CEA actuator is available in seven sizes and five variants, serving torque requirements up to 15,000 in-lbs (1695 Nm). Contact a product specialist to find out more about this new product and discuss your potential applications. Limitorque CEA Actuator Data Sheet from Mead O'Brien, Inc.